Burma is a classic source for some of the finest Peridot in the world. Though now overshadowed in production by other sources, this lovely stone illustrates why these set the standard. 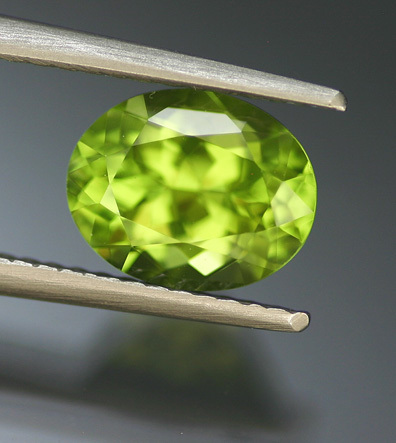 An excellent and distinctive 'Burmese' green, perfectly clean and quite bright this is a fine Peridot of a very respectable size. Moreover, the cutting is great and the gem is totally free of windowing - it is even calibrated for easy jewelry use. Simply a lovely piece from one of the great locales.